It is a great way to pick up a new sport or even just an excuse to get into the great outdoors. Lessons take place in waist deep water so don’t worry if you aren’t confident in the water. 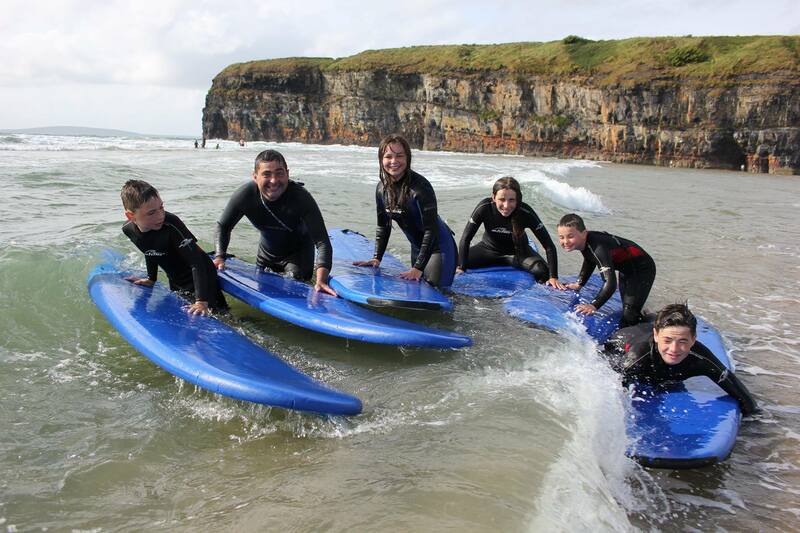 Our Surf School is approved by the Irish Surfing Association and all instructors are qualified beach lifeguards. 20 minute basic instruction, techniques, and stretching. 90 minute minutes surf/water instruction. To Book Call 087 7443732. Beginner lessons cost €35 for adults and €25 for kids (from 8 to 16yrs). Some surfers prefer not to learn within a group setting, so we cater for this with our expert private tuition all year round. Suitable for all ages, private lessons enable you to acquire good basic techniques for beginners / improver’s in surfing. These lessons are 1½ hours long and cater for 1 or 2 students. All equipment provided and changing rooms available. For those of you who can comfortably catch waves and are looking to progress their surfing this advanced class is the perfect opportunity to fine tune your skills. We keep the groups smaller so you can get the best out of each session. – Our instructors are here to help!!! Classes are grouped with surfers of a similar ability and experience so that the topics covered are relevant to that particular group.